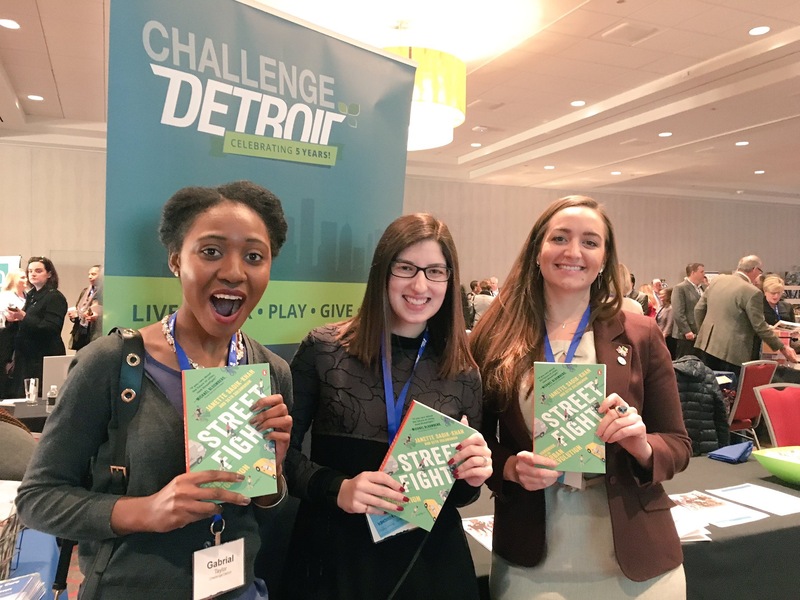 This month, I had the privilege of attending the 2017 Detroit Policy Conference hosted by the Detroit Regional Chamber with a group of my fellow fellows and Challenge Detroit leadership. It was an absolutely incredible day, filled with inspirational words from business, civic, community and government leaders with a shared vision and passion to innovate for a brighter Detroit. I looked forward to the conference in the days leading up to it, and in the end, it far exceeded my expectations. While each and every one of the speakers were valuable and had me furiously writing notes throughout their remarks, there were a particular few who stuck out to me. I’d like to reflect on their remarks and how they’ve influenced and inspired me as I continue my work with Challenge Detroit. Former Comissioner of the New York City Department of Transportation, Janette is currently with Bloomberg Associates, where she works with mayors around the world to reimagine and redesign their cities with innovative projects that can be developed quickly and inexpensively. I was truly blown away by how engaged I was with Janette’s talk. A little background: I’m from a very small town. The words “urban planning” were literally not uttered to me until I moved to Detroit. When I was first getting to know my fellow fellows at the beginning of our Challenge year, I was amazed by how many of them had backgrounds (or at the very least, an interest) in urban planning. It was difficult for me to wrap my brain around. As we’ve moved through the year, I’ve found myself (on more than one occasion) lost and useless in conversations about infrastructure, streets, buildings, green space, safety investments, etc. I felt that Janette’s remarks really helped bring me to a true, well-rounded understanding of the importance of these topics when it comes to the success of a city, and a little more about what it all means. A few concepts she was committed to throughout her remarks that really stood out to me: the importance of being a people-based city and including the voice of the community in any and all planning that takes place. These concepts are so often at the epicenter of the conversation when talking about Detroit’s future, and it was inspiring and informative to hear Janette touch on these topics, reiterate their importance and show how they have been a catalyst for success in other cities. I was able to pick up a copy of Janette’s book, Street Fight: Handbook for an Urban Revolution at the conference. I’m looking forward to reading it and continuing to grow my knowledge in this area so that I can continue to serve Detroit to the best of my ability. I was looking forward to hearing from Chris Illitch from the moment I saw that he was scheduled to speak, and I was unsurprised by his topic. His remarks focused on his father, Mike Illitch, and his legacy in the city of Detroit. The focal point of Chris’ speech was the driving force that made his father’s signature projects throughout the city so successful: teamwork and collaboration. This is something that’s close to my heart. Something I’ve reflected on in a previous blog post. A note I wrote in my journal during Chris’ speech sticks out to me: “leaning on people more knowledgeable than you”. If I learned anything in my time with Challenge Detroit, it’s the value of a well-balanced team, and understanding the importance of leaning on those team members when you reach their areas of expertise. It was so inspiring to hear the importance of this reiterated to our community by Chris, whose family is a prime example of the success that teamwork and collaboration can bring. I loved hearing him reflect on those Mike leaned on during his projects throughout the city, and his commitment to a team-oriented approach. This is something I will continue to value greatly throughout my career and time in Detroit. I will continue to reflect on my time with these influential leaders, and be on the look out for more opportunities to hear from them. I’m so grateful to have had the opportunity to attend this conference. Had it not been for Challenge Detroit, it would not have happened! I left feeling so inspired and energized, and will carry that inspiration and energy with me as I continue along my year as a fellow serving the city of Detroit.